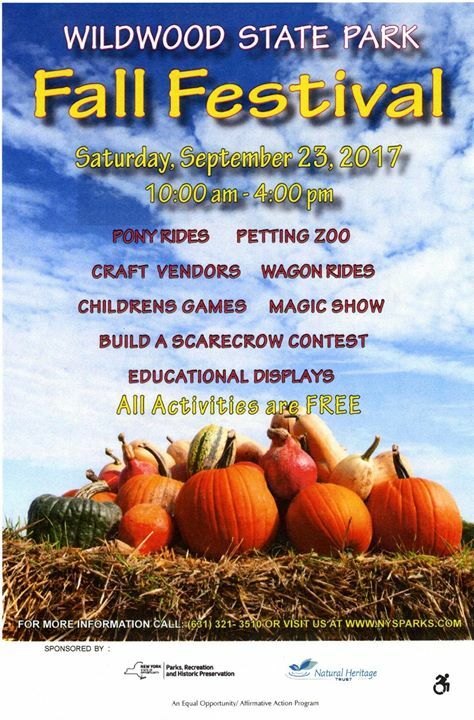 Join us for the 24th Annual Fall Festival at Wildwood State Park in Wading River on Saturday, September 23, 2017 from 10:00 am to 4:00pm, rain or shine. The festival will host craft vendors as well as live children’s entertainment, pony rides, a petting zoo, funny photos, inflatables (weather permitting), a wagon ride, build a scarecrow contest, environmental displays, children’s games, food and refreshments and much more. All activities are free. The Wildwood Fall Festival is sponsored by New York State Parks, The Natural Heritage Trust, WBAB 102.3FM, WBLI 106.1FM, Renewal by Andersen, NY Life, JR Water Corp. and Lewin Farms. For more information call the park directly at 631-929-4314 or Recreation at 631-321-3510. See you at the park!